Pope Francis’ openness to having a Vatican commission study the possibility of ordaining women deacons has created a great deal of discussion in recent weeks. It’s significant that he made this statement at the 50th anniversary of the International Union of Superiors General (UISG). The papal remarks highlight the role of Catholic sisters and nuns on the front lines of the church, where they provide essential services and push for change. Yet the discussion over the future of women deacons has overshadowed other important themes of the meeting—mainly the future of the global sisterhood. 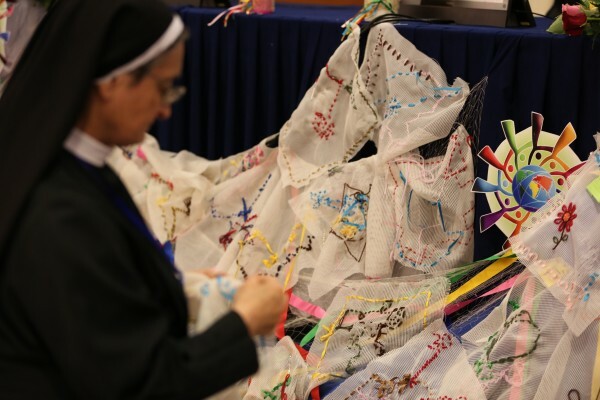 The theme of the conference was “Weaving Global Solidarity for Life.” On the first day, each table of sisters was given yarn, a needle and a patch. One sister would put a stitch in the patch and then pass it to another. This was continued throughout the week, emphasizing the idea that the more than 900 superiors, representing different religious orders, are all part of one, united global sisterhood. There were superiors generals from every continent on the globe, sporting habits that covered a wide spectrum of style and color. Live translation of the speeches occurred in 11 different languages. Through my role studying Catholic sisters for the Conrad N. Hilton Foundation, I was the only male in attendance at this triennial gathering (except for an occasional journalist and some tech people filming the event). As a complete outsider—a male and an Episcopalian—I have no skin in the future of religious life for Catholic women. Yet, I hope the global sisterhood is merely in a period of transition, albeit a painful one for those in the Western world. In the United States, the average age of a Catholic sister is mid-70s, which mirrors the demographics of sisters in much of Europe. In short, there is a crisis of numbers, with many religious orders having no new entrants to their ranks. In contrast, the novice houses in Africa are brimming with idealistic young aspirants. The situation with Catholic sisters is not too different from what is happening globally with Christianity. The locus of this 2,000-year old religious tradition is shifting from the northern hemisphere to the global south. It is among the poor in places like Lagos, San Salvador, Kerala and Jakarta that the message of Jesus resonates. The leadership of UISG is aware that their ranks are threatened by the lure of affluence and individualism that drive the economies of the Western world. The call to observe chastity, obedience and the vow of poverty does not resonate among Millennials. Neither do the orthodoxies that hold together the disparate parts of big bureaucratic institutions like the Catholic Church. In contrast to Pentecostals (which I studied before sisters), the Catholic Church has built institutions all over the world—especially hospitals and schools. These are brick-and-mortar institutions with longevity, not ephemeral programs that come and go depending on the whims of the latest celebrity evangelist, which is often the case with charismatic brands of Christianity. According to the Vatican’s Annuarium Statisticum Ecclesiae, there are more than 5,000 Catholic hospitals in the world and more than 16,000 medical dispensaries. In Africa alone, there are 1,221 Catholic hospitals and more than 5,000 dispensaries, which are often the primary source of medical services in rural areas. And the number of Catholic schools is off the charts; in Sub-Saharan Africa, they have educated many of the region’s presidents and corporate leaders. Who is staffing these schools and medical facilities in the global south? Yes, Catholic sisters. They are the front line in serving people in the developing world who are living and often suffering on the margins of their societies. 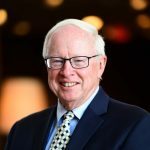 There is little doubt that the Catholic Church, along with many mainline Protestant denominations, is undergoing a transition. As noted above, the message of Jesus doesn’t resonate well with the rich and affluent. Nor with those who follow the siren call of the Western world’s ideal of radical individualism. According to one of the speakers at the UISG meeting–Sister Mary Sujita, from Bihar, India–God is to be found on the periphery, among the marginalized of society. She encouraged sisters to encounter Jesus among the poor as well as among migrants and women and children who are being sexually trafficked. Regardless of whether women ever become deacons in the church, the global sisterhood’s mandate is clear, according to Sujita: Renewal within congregations of women religious will come through their encounter with the heart of Jesus in their work on society’s margins. It is little wonder that the global sisterhood is growing in the developing world—this is where sisters encounter Jesus on a daily basis as they live out the charism of their spiritual community. In the global north, religious vocations will be attractive to only a few idealistic women who are counter-cultural in the best sense of the term—they see the emptiness of many contemporary values and seek meaning in a life of contemplative action. In another 50 years, the global sisterhood reflected in the gathering of superiors general may look very different. While there were numerous African sisters at the UISG convening in Rome this year, I suspect their numbers will expand, given the vitality of religious orders in this region of the world. This year there was one table of sisters from China. I suspect we will see many more in the near future, given the exponential growth of Christianity in China. There will also be a growing number of representatives from other Asian countries. What about European and North American sisters? If current trends continue, many may be wearing habits that match those of their sisters from the global south.